The first key to improving power is to improve efficiency. I’ve talked about this time and again, but I like to take the easy gains first, before I have to make my athletes start pushing heavy weight. Think about it like this: If someone is running around with stiff hip flexors, lats, or spinal erectors, they won’t be able to effectively extend their hip. And if they can’t effectively extend their hip, that’s going to hinder their ability to run fast or jump high. This is why it’s not uncommon for us to see massive changes in an athletes’ performance in a matter of weeks training with us. And how do we know that’s the case? It’s easy – they probably aren’t getting pushed all that hard with big lifts (i.e. squats, deadlifts, etc.) during that time frame. So these improvements can’t be due to improvements in strength, but rather, they are due to improved movement efficiency. Furthermore, if someone doesn’t move well, it doesn’t make sense to load them up. If you can’t squat or deadlift with a neutral spine, should I throw caution to the wind at start loading up that pattern? Instead, I’ll improve movement quality, posture, and body positioning first. I’ll teach them how to recruit their abs, extend their hips, and breathe more effectively. This is the first training block of my programming for an athlete. I want to take the first 4-6 weeks and get you moving as well as possible, so that future phases can be built up on this. And if they’re a young athlete, or they move quite poorly, it could take longer. But I always want to build a movement foundation first. After the foundation is laid, then we can move on to Key #2, which is getting someone stronger. Let’s be honest here, being strong is cool. And not simply because you’re a more functional and useful human being. Trust me, if you’re strong every friend will know, and you’ll be the first one they ask when it comes time to move them out of their apartment, house, etc. In our world, strength is cool because it has a spillover effect to other physical qualities such as speed and power. Anecdotally, I’ve seen this in my athletes for years. When I was first starting out at Ball State, I worked with our Women’s Volleyball team, and as a whole, their maximal strength levels sucked. We created a training program that had them squat (in-season!) twice per week. Keep in mind they’re practicing, traveling, and competing, so you would expect their performance to go down. Right? On the contrary, we saw an average of a 1 inch increase on their vertical virtually across the board! Their ability to create force was very poor (as evidenced by their abysmal squat performance). So as we increased the “FORCE” component of the equation, and voila, their power production went up. And keep in mind, that was over 13 years ago. I’ve worked with tons of athletes since then, and the results are nothing if not predictable (and repeatable). Maximal strength is often thought of as your glass. If you have an 8 oz glass, you simply don’t have a ton of potential to convert that strength into power. On the other hand, if you can make your glass bigger (i.e. get stronger), now you have more potential to take that strength and convert it into speed or power. As a physical preparation coach (and former powerlifter), these can be tricky waters to navigate. And trust me, there’s truth to that. It’s rare (outside of possibly football) to see an athlete who can’t benefit from hanging out in the weight room for a few months and get stronger. But getting stronger isn’t the end game. Strength, for strength’s sake, isn’t necessarily what you’re chasing. Strength is merely the gateway to improved power. If you just took your glass from 8 oz. to 20 oz., you’ve got the potential to improve power. But this is the critical – you have to take that potential and actually convert it! When I was doing the literature review for my thesis, I remember reading a study (I believe it was by Bobbert, but don’t quote me on that), where they used a maximal strength intervention with male volleyball players. They got them stronger, but they did not see an improvement in their vertical jump. When they went back, they saw the error in their ways. They had gotten them stronger, but never practiced the actual skill of jumping! That’s why I always use the term “potential” when it comes to maximal strength and power. Max strength increases potential power, but then you actually need to go about training power to realize those potential gains! So get stronger, then start converting that strength to power. 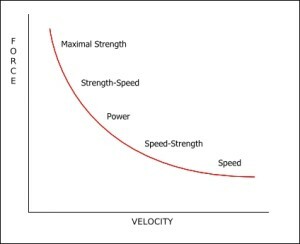 We’ll talk more about the force-velocity curve later this month, but if maximal strength is at the at the top left, you need to decide what kind of “power” it is that you want or need. If you’re an offensive lineman, you might need “strength-speed.” There’s still power involved, but it appears much slower as you’re trying to move another large human being. On the other hand if you do more jumping, running, and cutting (i.e. 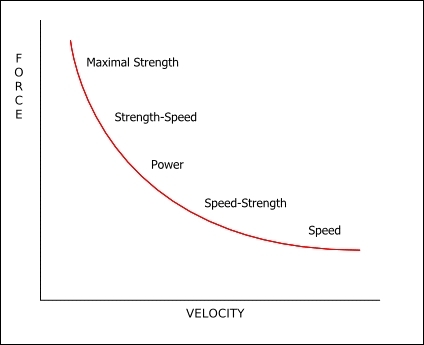 team sports), you may benefit more from focusing on speed-strength. And if you don’t really know what you need, or simply have a ton of time, you can work on “sliding” your way down the force-velocity curve. Take some time and build maximal strength. Then maintain that max strength, but add in some Olympic lifting derivatives (i.e. strength-speed). Then maintain those qualities, and start to add in some ballistics like med ball throws or squat jumps (i.e. speed-strength). Working in this fashion will not only help you maintain your maximal strength levels, but convert it to a broad base of power production as well. If you play sports or coach athletes, power reigns supreme. The ability to produce force quickly is a game changer. When writing a program for yourself or your athletes, focus on these three keys for power production. I guarantee you’ll get great results! Like it Mike ….good stuff that all makes sense. I feel anybody can do med ball stuff and love to insert that into my programming. Do you do alot of strength/power combo’s in the same program/training? I don’t do combo’s initially. Instead, I’ll do more power training up front (when the nervous system is fresh), and then move into strength work from there. Thanks Mike. I do similar things in my training’s. But i do the occasional strength power combo. I can coach the strength, I can coach the speed-strength I just need to work on coaching strength-speed(Olympic lifts). They’re not as easy as they look. Great article Mike. training or do you advise to do them before your strength exercises? I will incorporate power work from the start, it’s just the ratios, exercises and intensity I’ll play around with. In an initial phase, it may be very general and almost work as an extended warm-up. In the strength focused phases, we’ll add a bit more intensity and choose more challenging lifts. And obviously the power phase is very power focused. One thing I notice increases strength production is stability. I can throw you like a rag doll if you are unstable. You can be bigger, stronger, faster and better looking, but if I can get you unstable, off balance, and have better leverage than you, your mine. The converse is true meaning the more stable, balanced and leveraged I am the more force I can produce. My point is training balance, mastery of movement and structure translates into increased power, and quite possibly can make you better looking, for those of you that need improvement.